Players can choose different clubs to make up a complete set. 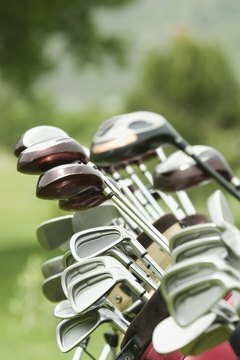 USGA rules declare that a golfer may carry up to 14 golf clubs in his bag. Which clubs the player chooses to form a complete golf club set varies according to his ability level and preferences. There are some guidelines to follow when putting together a set of clubs. Traditionally, golfers carry a driver, a couple of fairway woods, some irons, specialty irons called wedges, and of course, a putter. The driver is the longest club in the golf bag. It also has the lowest loft, which makes it a difficult club to master. Some drivers promote particular kinds of tee shots, like a draw. Many golfers carry a driver, but some prefer to hit a 3 wood off the tee. The 3 wood and other woods can be used for long and straight fairway shots. Advanced players may carry a 3 and 5 wood, while high handicappers may opt for a 5, 7 and 9 wood, which are more lofted and easier to hit. The traditional complete set of clubs includes the 3, 4, 5, 6, 7, 8 and 9 iron. Recently, many manufacturers have changed the loft of these irons so that they can provide more distance. This means that the loft of each individual iron may be changed to a lower loft, which is harder to hit. Many golfers opt to eliminate the 3 and 4 iron and replace them with hybrid golf clubs. Hybrid clubs have become favorites with beginners and advanced players alike, because they are designed to provide the distance and accuracy of long irons, but they are easier to use. The design of a hybrid offers a larger clubface like a wood, combined with a shorter shaft like an iron. The center of gravity is moved toward the back and the bottom of the club, making it easier to launch the ball up into the air. Hybrids typically come in lofts of 16 to 26 degrees. Your lowest numbered hybrid should get a distance of approximately 10 yards shorter than your highest numbered fairway wood. Players might replace a 3 and 4 iron with hybrids from 3 to 6. Wedges are high-loft specialty irons designed for a specific purpose. A complete set of golf clubs typically includes at least two wedges, usually the pitching wedge and sand wedge. The pitching wedge is used close to the green, and the sand wedge is used out of fairway bunkers and sand traps around the green. In addition, some players carry a gap wedge with a loft between that of a pitching wedge and a sand wedge. For close, lofted shots to get over a hazard near the hole, players might use a lob wedge. No set of golf clubs is complete without a putter for use on the green. The putter is designed for shots that are a few yards or closer to the hole. A shot with a putter will stay on the ground. Golfers can choose from a number of design features, including newer putters with long shafts. The best putter is the putter that you are comfortable and successful with.